Tech Center: It doesn't matter if Google TV never comes to India. It doesn't matter if Google TV never comes to India. Google TV is set to revolutionize the world by changing the way people view TV but only a few people know that a device/platform similar to Google TV (GTV) is already out there from a long time. "It is a device which is one of the first to be truly convergent says , NextBiT Computing". NextBiT Computing has created a patented technology named MODYA video-on-demand server architecture and middle ware technology which allows to deliver video on demand content and services over networks at just 3% of the infrastructure costs and bandwidth, which has been a problem for traditional VOD service providers. Just like the up coming Google TV it integrates TV and internet and brings it to your TV screen. The user can surf by using the browser, cloud PC, Facebook, Twitter, YouTube, BitTorrent, Flickr, and many more applications directly on the TV screen. It has an app store which lets you download applications, media codec so you can play any media file format. Also an added feature is the Video phone application, which allows users to make and receive video calls in high definition. 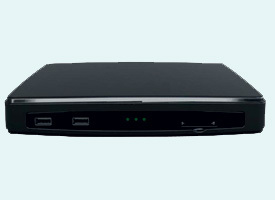 Whats more is that the TVeeBox supports almost all type of connectivity options like RCA, VGA or HDMI. It TVeeBox core only costs Rs 7,000 and Rs 10,000 which is quite good. Its is totally integrable with rich graphic and feature rich media and convergence applications for device manufacturers.